You have heard it before, I’m sure. Sweet tamales are a labor of love. But it doesn’t mean you have to spend 3 days in the kitchen making them. 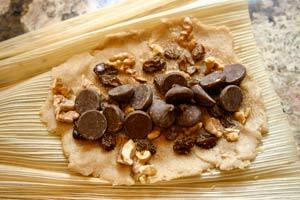 Making this sweet tamale recipe is as easy as making chocolate chip cookies. And almost as good. You know I am partial to my chocolate chip cookie recipe don’t you? We will save that for another baking day. I think we got the notion that making a homemade tamale recipe is a huge undertaking because we hear about people making these huge batches of tamales over 2 or 3 days. They are making 15 to 30 dozen. I agree, that is a major undertaking that requires 4 plus people working an assembly line. I’m exhausted just thinking about that many tamales. I have a friend whose family makes tamales every Christmas. This year 14 of them got together and made 40 pounds of masa. They ran out of pork filling so they decided to make tamales de dulce (another name for sweet tamales) to finish off their masa. My friend couldn’t even remember how many tamales they made. But it was a lot, let me tell you. And they were really good. 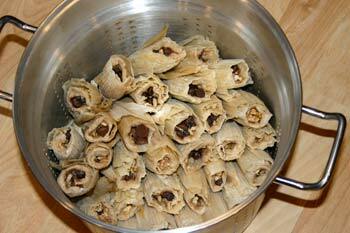 By the way, if you are looking for my pork tamales, you can find my pork tamales recipe here. My recipe for these little dessert tamales is going to have you out of the kitchen in about 3 hours. We will make about 30 tamales. A nice amount for your family to enjoy. You can even freeze some for later. Are you up for it? 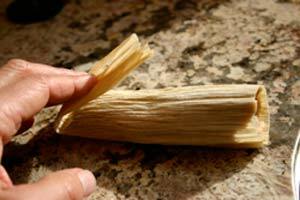 Read on and I will show you how to make sweet tamales you are sure to enjoy. Before we start you must have a tamale steamer. 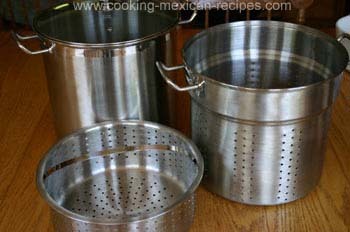 These are designed specifically for cooking tamales. 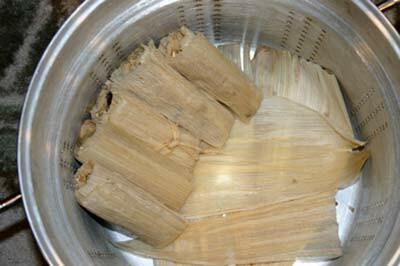 The steamer insert is at least 7 inches deep so that the tamales can cook in a vertical position. Here is a picture of the one I use. Notice the taller insert. That is the one you will use for tamales. The shorter one just happened to come with my pot. A tamale cooker can be purchased online or in department stores. 1 bag of chocolate chips, I like Guitard brand. Use milk chocolate or semi-sweet. First place walnuts on a cookie sheet in a preheated 350 degree F oven. Make sure to spread out the walnuts so they are all touching the pan. Bake for 12 to 18 minutes until they are nice and brown. After they cool, chop coarsely. Place raisins in a bowl and cover with water. Microwave for about 1 minute to make the water hot. Let raisins re-hydrate for about 10 to 15 minutes. Drain and set aside. Doing this will make your sweet tamales that much better. Your raisins will be juicier and softer. You can do this for any recipe calling for raisins, dried blueberries, cherries etc. In a small bowl, combine 1 1/2 tsp. of sugar and 1 tsp. ground cinnamon. Set aside. Soak corn husk in hot water for at least 30 to 40 minutes or until softened and you can separate them. 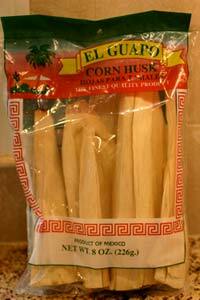 Here is a picture of what the corn husks will look like when you find them in the grocery store. One package is enough for this recipe but having extra is always a good idea. You can never be sure how many husks you will get in a package and you will need 30. 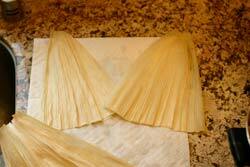 The corn husk come clumped together and stiff so you must soak them to get them apart and be able to work with them. Soak them in a pot of hot water. Then place another pot or what ever you have available on top to hold the corn husks down into the water as they like to float. I used a slightly smaller pan and placed more hot water in that, to weigh it down. A dinner plate would work just as well. Here is where I placed a smaller pot inside the pot with corn husks. Once the husks start to soften, you can start separating them in the water to speed up the process. You will notice the corn silk or stringy stuff in the center of the husks. Just pull that out and throw it away. Change out the water as it starts to cool. After 30 minutes to an hour when the husks seem pliable, take them out of the water to drain on a towel. Make sure they are all separated and laying flat. Pat them dry with paper towels and set aside. First make sure you buy masa harina for making tamales. You cannot substitute regular corn flour or corn meal for this recipe. Maseca is an excellent brand for this. I use a kitchenaid mixer for this recipe but a regular hand mixer will work too. Cream the butter, crisco, sugars and vanilla in a bowl. 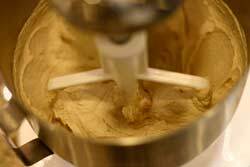 You will notice it looks very much like cookie dough. 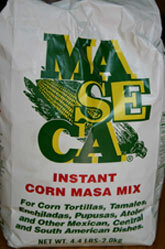 In another bowl add the the masa harina corn flour, salt, baking powder, and cinnamon. Mix well with a spoon. Add the dry mixture to the creamed sugar one or two large spoonfuls at a time. Once the mixture starts getting very thick, start adding the milk a little at a time. Continue to alternate the flour and milk until it is all mixed in. You should end up with a consistency of cookie dough or a little softer than that. Grab a corn husk and place it so that the pointed end is facing away from you. Put about 3 tbsp. of masa in the middle and close to the end next to you. I find it easier to spread masa with my fingers instead of a spoon. Use what works best for you. In the picture below, the pointed end of the husk is on the left. The top of the tamale is on the right. Keep the masa back from the end of the husk, about 1/4 inch on the top (right) side. 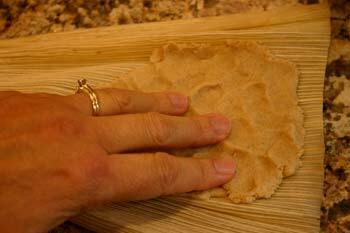 Spread the masa as uniformly as you can about 4 inches long by 4 inches wide. This is just a guideline. Do leave 1/2 inch border on the side you are going to roll. Grab a small amount of raisins and sprinkle them on the masa. Do the same with the walnuts. Press the raisins and walnuts into the masa a little bit. This keeps them from falling out when you roll it up. If you put too much filling in especially when you add the chocolate chips, you will have difficulty rolling the tamale up so play with this a little. I’ve got a picture here to give you an idea how much to add. I happen to love chocolate so I make sure to have plenty of that. 🙂 Feel free to adjust the proportions to your liking. Notice in this picture that I added the chocolate chips down the center of the masa. This is to make rolling easier. At this point I add just a sprinkle of the sugar/cinnamon mixture. This is optional but I like to add just a bit for more flavor. I sprinkled about 1/4 teaspoon over the raisins and nuts. Grab the end of the husk and roll the masa over to the other side to enclose the filling. Roll it snugly. The masa should surround the filling but not overlap too much. Fold the tip of the husk over at the point of where the masa begins. If the husk won’t stay folded, you can tear off a long thin piece of husk (from another piece of husk) and use that to tie around the tamale. Do not tie it too tightly as the masa needs room to expand as it cooks. 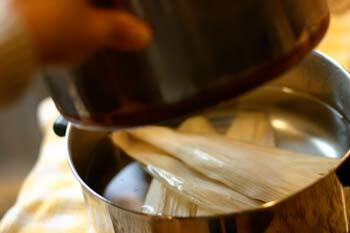 Line the bottom of your tamale steamer with a layer of extra corn husk. 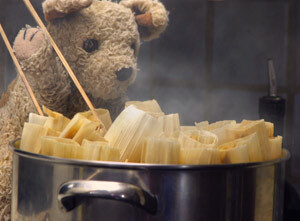 Make sure to only put enough water in the pan so it does not touch the tamales when they are cooking. Notice the one tamale in the middle that wasn’t cooperating. It had to be tied closed with a piece of corn husk. 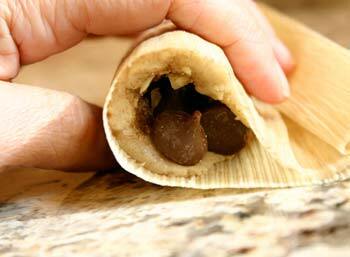 Each time you complete folding a tamale, place it in the steamer, open end up. Pack them loosely as the masa needs room to expand. Have I mentioned that enough? Once you get all the sweet tamales in the steamer, lay a piece of foil over the top of the tamales and place a damp white towel on top of the foil. Cover with the lid and put on high heat to get the water boiling. Once it is boiling, reduce heat to medium and cook for 1 to 1 1/2 hours, sometimes even 2 hours. . Check your water level every once in a while. It’s easy to boil it away. 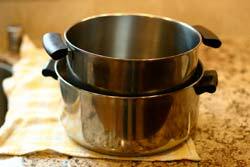 Tip– Put a quarter in the bottom of the tamale steamer, in the water. It will rattle while the tamales steam. If it stops rattling you will know the pot has run out of water. Hurry, add some more. After one hour, remove one tamale and unwrap it. If the husk pulls away cleanly it’s probably done. Check one more tamale to be sure. If the masa is sticking or is mushy, replace it in the pot and cook for another 15 minutes and check again. This sweet tamales recipe freezes well. My dad says the best way to reheat these tamales is by steaming them again. It will probably take 20 to 40 minutes to reheat these with this method. I would wrap them in foil first. If you are very careful, you can reheat them in the microwave. 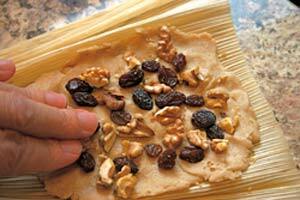 Place tamales on a plate and cover or wrap with damp/wet paper towels. Cook on high 30 seconds at a time until they are just hot enough. Be careful, the microwave dries them out. You can keep sweet tamales in the refrigerator for up to a week if they are well wrapped. In the freezer they will keep 3 or 4 months. I keep them in the freezer and when I when I get that urge for something chocolaty and delicious, I pull one out, wrap it in a wet paper towel and microwave it on high for 30 seconds. They go great with hot tea or Mexican hot chocolate. Try some of our other dessert recipes too. Check Out More Pork Chile Verde Recipes.